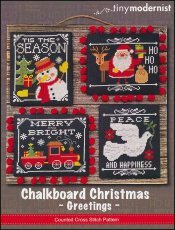 Chalkboard Christmas Greetings [E5637] - $12.00 : Yarn Tree, Your wholesale source for cross stitch supplies. Cross stitch pattern from Tiny Modernist. "Chalkboard Christmas Greetings," with their fun designs & brights colors, will help you get into the holiday spirit! The first design is of a snowman standing in front of a Christmas tree with a present. Above the snowman, "Tis The Season," is stitched. The second design is of Santa & Rudolph. Santa is holding a few presents with his bag sitting beside him. "Ho, Ho, Ho," is stitched along the side. The third pattern is of a train carrying Christmas presents & a tree. Snowflakes are falling in the background with "Merry And Bright," stitched at the top. The fourth pattern is of a dove. "Peace And Happiness," is stitched on this design. Stitch count 56h x 70w.